This summer I prepared for the family reunion a crock pot of simmered chicken breast with minimum seasoning. 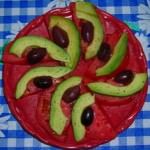 This was to meet dietary needs of those who could not tolerate garlic, barbecue sauce, diabetic, or need for fat free foods. I bought six large skinless, boneless chicken breasts, trimmed off any fat, and cooked them in the crock pot with one 14.5 ounce can Swanson 99% Fat Free Chicken Broth and water to partially cover the chicken. 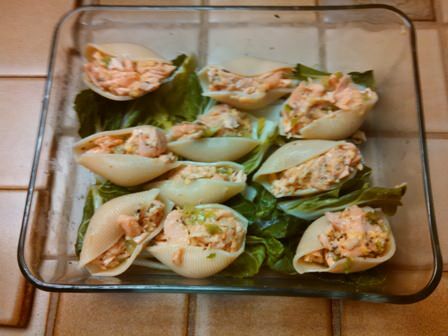 I cooked it in the crock pot to take and serve at the reunion. What was left over, I drained and froze to use later in casseroles and Chicken Noodle Soup. 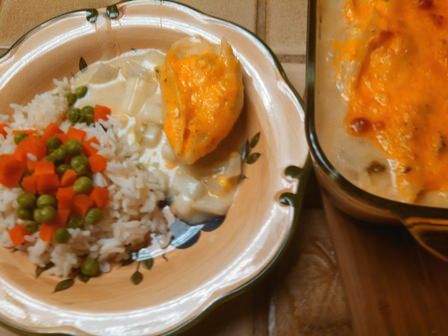 Home-made Precooked Chicken Breasts and Broth. 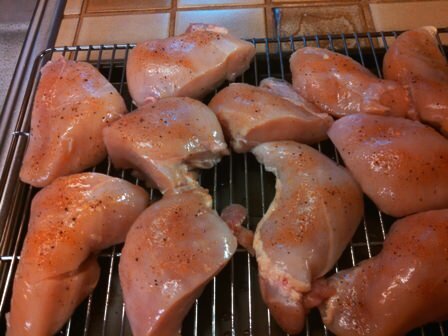 Those precooked chicken breasts did not last long. It was just too easy to go to the freezer and thaw one or two breasts for a quick evening meal. 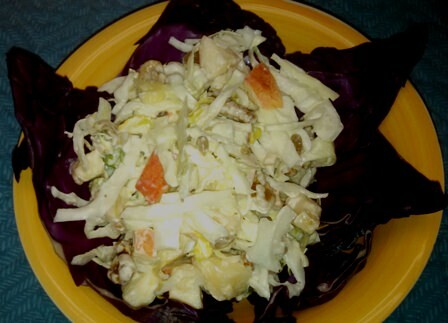 The next time I prepared the chicken breasts, I seasoned them with a spice blend Into the slow cooker I added 1/2 cup sliced onions, 1/4 cup finely diced celery, arranged the seasoned chicken breasts on top of the vegetables and added the one 14.5 ounces can of chicken broth and water to almost cover. 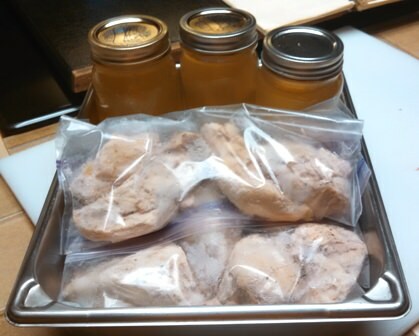 Cooked chicken breasts ready to freeze; canned broth. Chicken vegetable soup is good, but isn’t chicken noodle soup suppose to be the answer to what ails you? So this is was the inspiration for Slow-Cook Chicken Noodle Soup recipe. Although I do a lot of cooking, there have been some recipes I just don’t attempt. Noodles has been one of them. I guess the first endeavor they turned out tough and like shoe leather or leather shoe strings. So some years later, I thought I would try them again. This time it was success. Using my mother’s recipe from her cookbook recipe box, I made noodles. 1 tablespoon milk or teaspoon more if needed. Beat the egg in a medium size bowl. Mix in the oil and milk. Add the dry ingredients and blend with a fork. Work the dough into a ball. 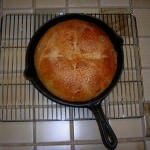 Lightly flour bread board and roll out thin. Cut into 2 inch strips, layer and cut into narrow strips. Allow to dry. Note: My preference is a wider noodle, 1/2 inch. Drying time is about 1-2 hours before using them. What is not used, I bag and freeze. This makes a small batch of noodles. 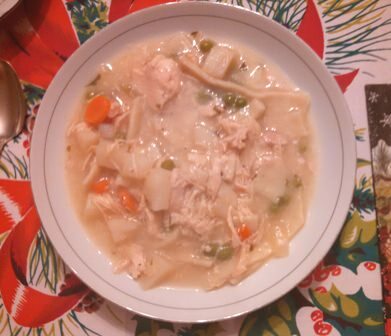 Enjoy a rich soup of chicken, vegetables and noodles to soothe you through the cold chill of winter. 2 cups of broth from the precooked chicken breasts, including the onion and celery in the broth. Place the vegetables on the bottom of the crock pot. Cook about 1 hour on low or until boiling. Continue cooking on low for about 3 hours or until the noodles are done. Recipe for precooked chicken breasts and egg noodles are in the Blog content. 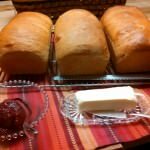 Honey Whole Wheat Bread just out of the oven. 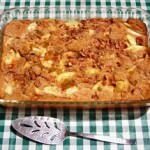 Julia Ann and cookbookinabox® in partnership with Netta Belle’s Choice® bring you great recipes for your cooking experiencee. ©2007-2018 Netta Belle’s Choice® cookbookinabox® “Reg. U.S. Pat. & Trdmk.Off.”Reg. “Trade-marks Canadian Intellectual Property Office.” nettabelleschoice.com and cookbookinabox.com. All rights reserved. 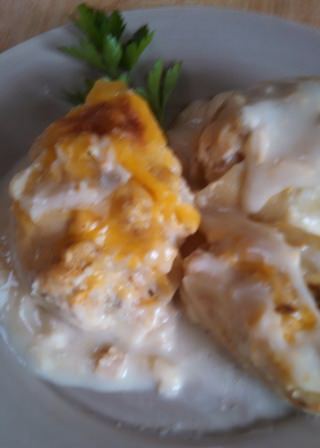 This entry was posted in Pasta and Rice, Soups and tagged chicken breasts, chicken broth, crock pot, noodles, Slow cooker, soup on January 27, 2015 by Julia Ann. 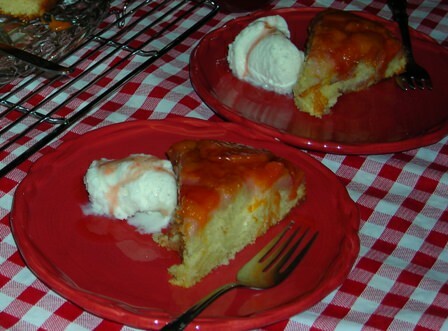 Ready to enjoy Peach Upside-Down Cake with a scoop of ice cream. Don’t you like it when you find a quick recipe and make little changes you have another delicious dessert? This is how I think of the Netta Belle’s Choice® Upside-Down Cake. 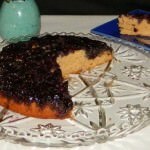 It is the same basic cake layer dressed up to which ever fruit is in season. 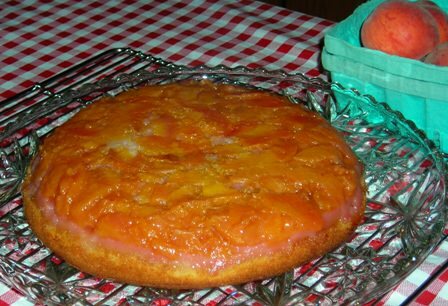 I started out with just making pineapple upside down cakes, then did not have pineapple. Blueberries were in season and later peaches. 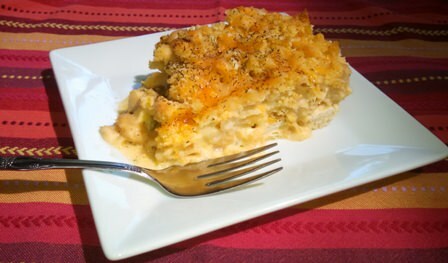 So 2 new cakes were added to my Netta Belle’s Choice® cookbookinabox® Recipe Box. 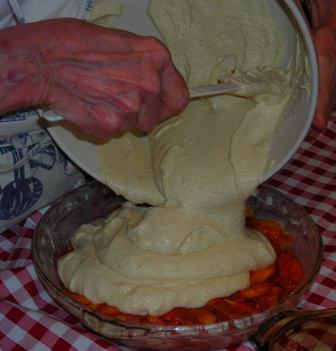 Pouring cake batter over peaches. 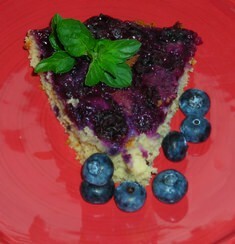 A quick and easy dessert of a moist butter cake dressed up with seasonal sweeten fruit on top. Preheat oven 350 F. Preheat a sheet of foil on the lower shelf to catch drippings. Grease a 10-inch deep dish pie plate. Peel and slice the peaches into the lemon juice. Mix the melted butter and brown sugar in a small bowl. Spread this on the bottom of greased pie plate. Drain the peaches, dry off any excess juices. 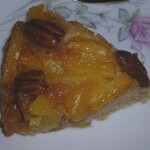 Arrange the peach slices over almonds and butter/ brown sugar mixture. Whisk together all the dry ingredients: flour, baking powder, salt and spices. 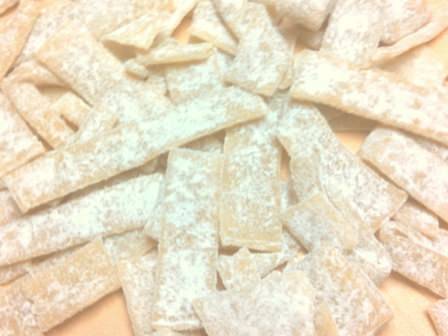 In a larger bowl, beat together the butter and sugar until light and fluffy. Alternate adding the flour and milk, beating after each addition until well blended. Spread the cake batter evenly over the peaches. Bake in the middle of the oven for 45-55 minutes, or until tester comes out clean. Cool the cake on a rake for 15 minutes. Run a knife around the edge to loosen cake, invert cake onto a platter. 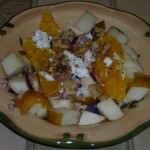 cookbookinabox® in partnership with Netta Belle’s Choice® bring you great recipes for your cooking experience.©2007- 2018 Netta Belle’s Choice® cookbookinabox® “Reg. U.S. Pat. & Trdmk.Off.” Reg. “Trade-marks Canadian Intellectual Property Office.” nettabelleschoice.com and cookbookinabox.com. All rights reserved. 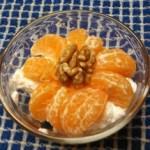 To get your creative juices flowing, here are a some pictures of other fruit ideas. Humm… I think I will make the cake, put it on a platter and slather it with whip cream and cover it with fresh strawberries and drizzle chocolate on top. Go to go! Cake, strawberries and whip cream are awaiting. ENJOY your choice Upside-Down Cake. This entry was posted in Desserts, Pasta and Rice and tagged blueberries, butter cake, dessert, peaches, pineapple, upside down cake on June 13, 2014 by Julia Ann. Red bell peppers have become a favorite at our house. I have oven roasted peppers available in the freezer most of the time. They are available to add to sauces, soups, meatloaf or stews. Roasted red bell peppers are good with oregano, olive oil, garlic, and balsamic vinegar. Now that is a completely different recipe. For a festive and nutritional entree for a family night dinner, serve Red Bell Peppers Stuffed w/ Beans and Rice. 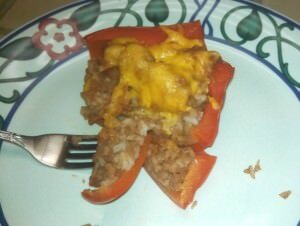 This is one of those dishes that came about when I had lots of peppers and left over rice. Just the beginning fixings for stuffed peppers with addition of refried beans. Red bell peppers are stuffed with seasoned rice and refried beans, topped with cheese and baked. A good way to use left over rice. Preheat oven to 350 F. Lightly oil baking dish that will peppers upright. 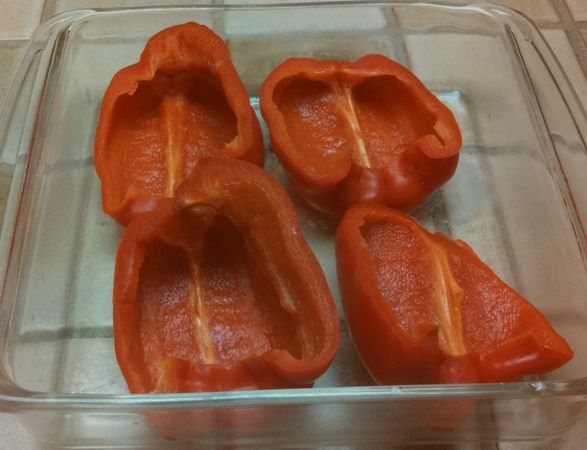 Cut bell peppers in half lengthwise, remove seeds, wash inside and out. Parboil peppers in boiling water for 3 minutes, drain and set aside. 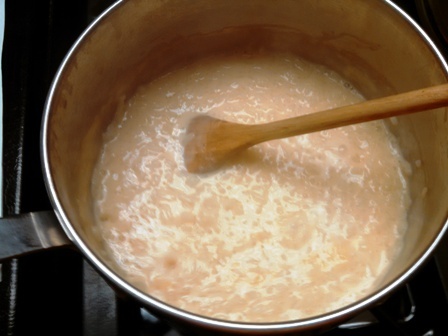 In saucepan, combine rice in the cup of broth and cup of water. Bring to boil and simmer until tender and water absorbed, 15-20 minutes. In a microwave dish, blend the fat-free refried beans, tomato paste, onion and hot sauce to taste. Add more broth to make beans a thinner mixture. Heat 3 minutes to heat through. 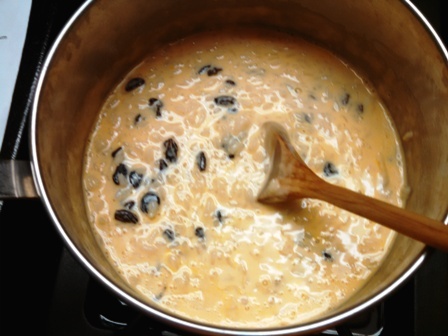 Mix 1½ cup of rice and 1½ cup of bean mixture. 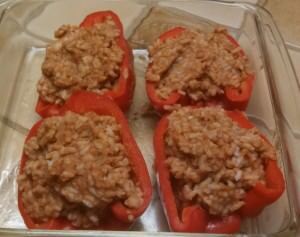 Stuff parboiled bell pepper cups the rice/bean mixture. 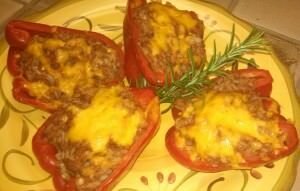 Set stuffed peppers in the prepared baking dish, top with shredded cheese until heated through and cheese is melted. 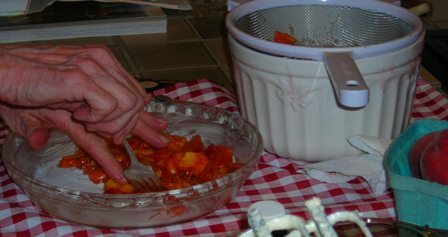 I use 2 large red bell peppers, cut lengthwise, wash inside and out, remove the seeds and white membrane from inside the peppers. 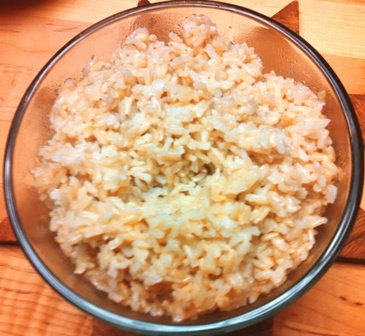 The first time I made this I had left over white long-grain rice, otherwise, I prepare the rice. Brown rice would be an excellent rice to choose for the healthy benefits. 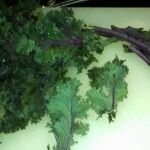 Serve with steamed kale or lettuce salad. Bell peppers are an excellent source of beta-carotene, vitamin C, A and E. The nutrients give antioxidant and anti-inflammatory benefits, to help prevent disease and infections. Beans are known for non-animal protein, vitamin B 6, fiber and complex carbohydrate which is slower to digest and gives energy. Refried beans may contain bacon fat or lard, onion or garlic. 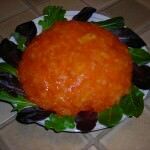 There are canned fat-free refried beans available. 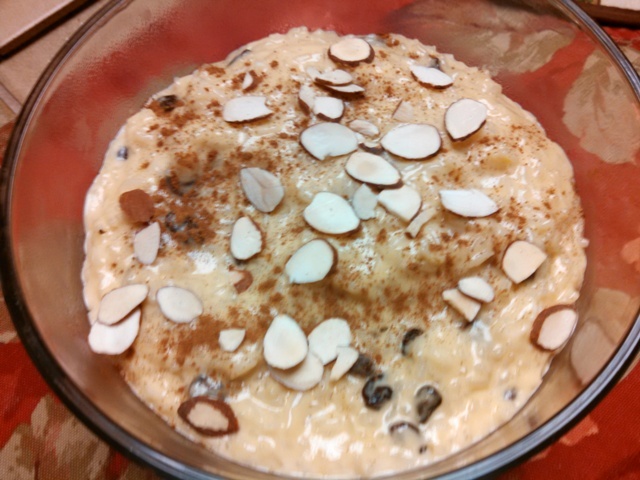 Rice is an important source of complex carbohydrates. 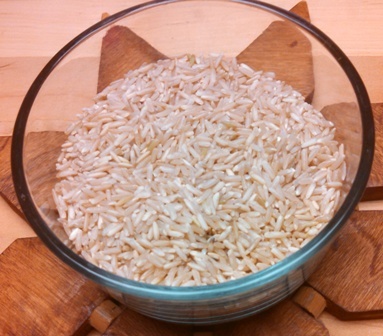 White rice grain had the germ and bran polished away which does decrease the nutrient value. Enriched white rice has folate, vitamin B, added. Brown and wild rice have more nutrients and fiber, therefore considered healthier. 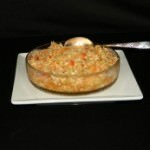 There are many types of rice different nutritional values. ©2007-2018 Netta Belle’s Choice® The Art of Gourmet Cookery® cookbookinabox® “Reg. U.S. Pat & Trdmk. Off. Reg. “Trade-marks Canadian Intellectual Property Office.” Netta Belle’s Choice® The Art of Gourmet Cookery® cookbookinabox® All rights reserved. 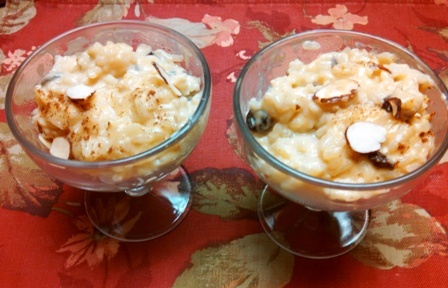 This entry was posted in Pasta and Rice, Vegetables & Side Dishes on September 26, 2013 by Julia Ann. gives a change to your menu. 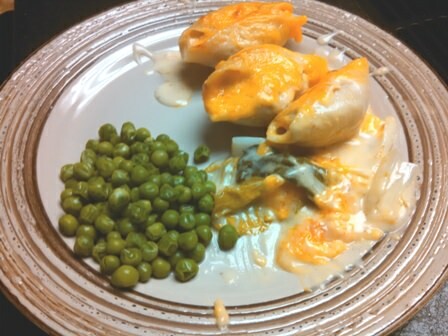 Do you serve mostly southwestern, southern, midwestern meals, Italian, Indian, or Mexican cuisines? 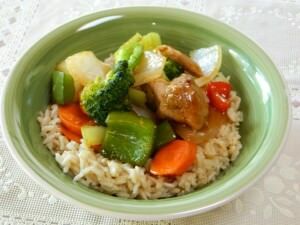 Here is a recipe for Oriental Vegetable and Rice Bowl. As cooks, it is so easy to get into the habit of fixing the same thing over and over particularly if your family is busy and on the go. I have found by serving one type of cuisine, there is a likelihood of having all the ingredients. However, when you like to cook, it is challenging and fun to try something different. 1. Fast cooking at a high temperature is a key to Oriental cuisine. 2. 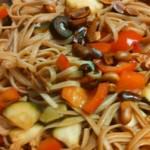 The chief protein in the Oriental diet is the soybean: as in soybean oil, soy milk and soy sauce. .3. 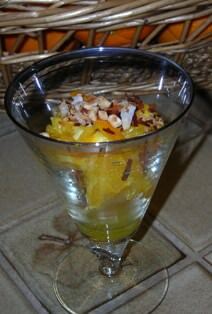 The rapid, minimal cooking helps preserve the flavor, color and texture in Oriental cooking. This Oriental Vegetable and Rice Bowl is a simple lunch or dinner dish. 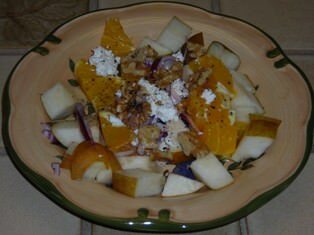 Add a fruit gelatin salad, crusty bread and fruit cup for a quick week day dinner. Stir-fried vegetable with pork and brown rice for a quick light meal. A good way to use left over meats. ½ cup broccoli pieces, cut to 1-inch pieces. Put broth and rice in large saucepan, bring to boil, cover and simmer 45 minutes. When broth is absorbed and rice is tender, stir, recover and let stand 10 minutes before serving. Put sugar, wine, vinegar, soy sauce and catsup in small saucepan, heat to boiling. Stir cornstarch into water until smooth. Heat wok or 12 inch non-stick skillet until hot, not smoking. Add oil, stir to coat pan and add meat stir to brown, remove meat, keep warm. Add onions, carrots, cook 1 minute. Add peppers and broccoli, cook vegetables 3-5 minutes. Add the meat to vegetables. Add the sweet and sour sauce to skillet cover and bring to a simmer. If using left over meat or poultry, just heat thoroughly with vegetables before adding the sweet and sour sauce. Inspired by The creative cooking course, the American Homemaker's Academy 1973.
cookbookinabox® in partnership with Netta Belle’s Choice® bring you great recpes for your cooking experience. 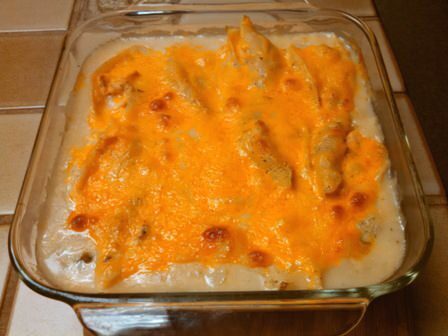 2007-2018 Netta Belle’s Choice® cookbookinabox® “Reg. U.S. Pat. & Trdmk.Off.” Reg. “Trade-marks Canadian Intellectual Property Office." 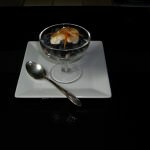 nettabelleschoice.com and cookbookinabox.com. All rights reserved. You have many options to develop your own special Oriental Vegetable and Rice Bowl by changing the vegetables, the rice and the meats. 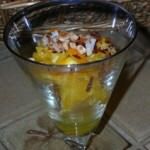 The basic sweet and sour sauce can have many changes of taste by using pineapple juice, and the pineapple in the vegetables, brown sugar, or different vinegar. Here are some suggestions to complete the meal. Enjoy Your Oriental Vegetables and Rice Bowl. Inspired by The Creative Cooking Course, The Creative Homemaker’s Academy 1973. 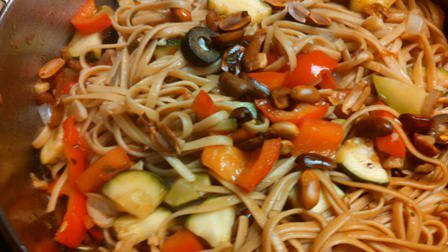 This entry was posted in Meats, Pasta and Rice, Vegetables & Side Dishes and tagged bell peppers, blueberries, brown rice, carrots, cuisine, oriental, pork, soy sauce on August 22, 2013 by Julia Ann. Fresh green beans from the garden are crisp, delicious seasoned with oil, lemon, pecorino romano cheese, and herbs. Many cook fresh green beans ‘all day’ with bacon or ham and maybe with potatoes. The idea was canned and overcooked green beans were best! My thoughts of frozen green beans just didn’t have the right taste. 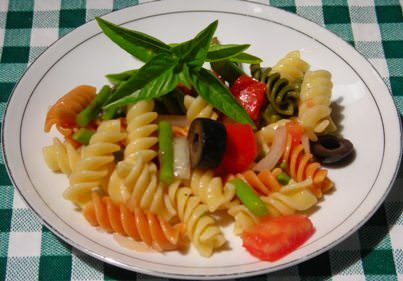 A comfort food dish of pasta and fresh green beans and red potatoes and light sauce. Bring water to boil in large kettle. Add green beans, bring back to boil 6 minutes. 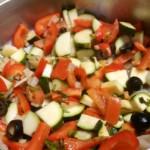 Remove with a slotted spoon, drain and rinse with cold water to stop cooking. Add potatoes to same water, cook until soft. Remove potatoes with slotted spoon, drain and set aside. 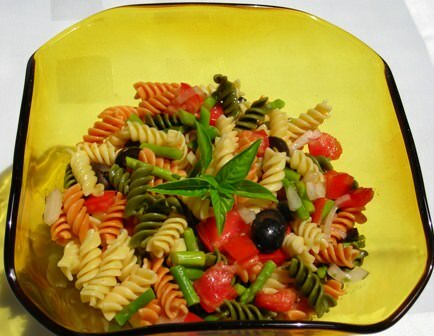 Add pasta to vegetable water cook per package instructions. When al dente, save 1 cup pasta water. Heat olive oil and butter in 12-inch skillet. Cook onion, garlic and celery until soft and onion translucent. 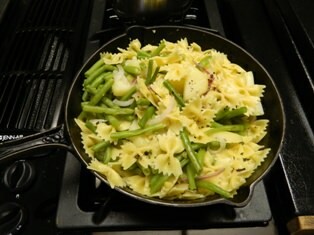 Add green beans, potatoes and pasts to skillet. care not to mash potatoes. Pour into serving dish or serve from the skillet. Sprinkle the cheese over the vegetables and pasta. 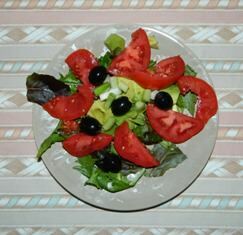 Serve a simple salad: spring lettuces, tomato, avocado, green onion and black olives with your favorite salad dressing. Julia Ann and cookbookinabox® in partnership with Netta Belle’s Choice® bring you great recipesfor your cooking experience. 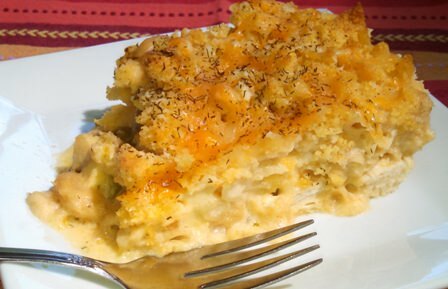 This entry was posted in Pasta and Rice, Vegetables & Side Dishes and tagged carbohydrates, green beans, oregano, pasta, pecorino romano, red potatoes on July 19, 2013 by Julia Ann.